Ein Haus Das Klingt at archive.org. 17 May 2016 was the 150th birthday of French composer Erik Satie. From today’s perspective, Satie can be seen as the predecessor of a concept of sound art that goes beyond (concert) music. Satie’s idea of ‘musique d’ameublement,’ or ‘furniture music’ embedded in everyday life and its sounds, is particularly relevant here as it anticipated both ambient music and sound installations. The ‘loop30’ sound art gallery celebrated Satie’s birthday by paying homage to this concept with a version of his piece ‘Vexations,’ a short piano melody that is supposed to be repeated 840 times. 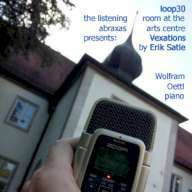 For ‘loop30,’ Wolfram Oettl played the melody on the piano in the Reesegarden Restaurant right next to the sound art gallery in the abraxas arts centre. Between repetitions of the piano melody we hear the ambient sounds of the restaurant. Music and ambient sounds were combined to form a 51-minute loop which, repeated 840 times, filled up the whole month of Satie’s birthday.